Babies grow up so quickly. First off they were just in their rocking bassinets and the only thing they do is cry and be cute. But just a few months after, they are already crawling all over the place reaching for whatever they can reach and start slobbering on rubber, toys, teethers, and more! It's worrying and you wonder why some unusual items around the house got drool on them. It's cute but it's really unsafe. Once your child already knows where to wander, you need to keep your alerts high up at all times so that they don't get hurt by sharp or falling objects, or by any dangerous chemicals that they can easily ingest. It's a good sight to behold if your little one just can't stay put, but they needed to be safe too. We completely know how it feels and getting your child a playpen is one way of letting your child play with 100% security. Play yards for babies are like bigger cribs. Actually, some cribs turn into playpens for your little ones. Most baby playpen brands make an all-in-one item that lets you buy one item but use it for multiple purposes. Play yards are just enclosed areas that your kids can freely play in or even sleep in. They have to be durable and versatile. Play yards for babies also need to be assembled easily but also easy to take down. They are lightweight and portable and most of all, they have to be secure. We listed down the top 5 best baby playpens Amazon has for us and basically made a pack and play reviews for each item. Spending time with your little one like reading books for toddlers or simply teaching your baby some fun nursery rhymes are some of the best ways to keep your child preoccupied. But when you are busy and you need them to behave and still have an eye on your toddler, you may consider having the Graco Pack n Play Playpen. It is really helpful to parents who also need some time to do other things. Dinner won't make itself and a dirty home won't tidy itself up either. That's why no matter how busy we are, we still need to know where our little ones are and what they are doing. That made us realize that the Graco Pack and Play is just the perfect item to have around the house. Graco is a well-known brand in making baby products and they are known to make quality products for the right price, including the Graco Pack and Play. For less than $50, you got yourself a spacious playpen for baby with a hanging nest bassinet to lay your baby to sleep. 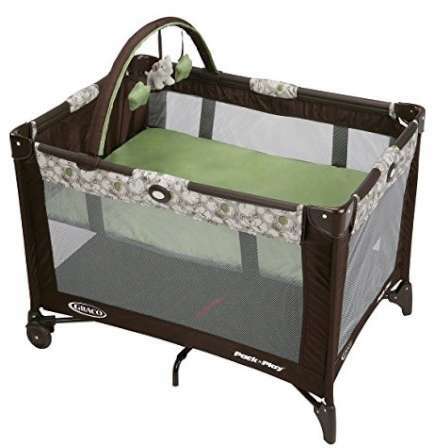 This playpen with bassinet is very comfortable for your baby to sleep on. The pack and playpen for babies come with built-in storage pockets to keep diaper changing essentials or you can keep toys in there as well once they can get the hang of reaching or some stuff. This playpen can be used as your baby changing station. You can either add a changing pad or not because the baby changing station is easy to clean. The bedding is made up of easy wipe-clean fabric to make clean-up a real breeze. With that said, your baby can make a mess and still make clean-up easy. Another plus factor is the feature that stands by its name—Pack n' Play! The packing part is really easy. It folds up nicely making it easier to pack, store and move around with. So, if you're planning on going for a long trip in another state, then this would be great for you. It has durable frames that won't easily be damaged on a long road trip. We love that the Graco Pack n Play playpen is not expensive and very convenient. That is why this best Graco Pack n Play is our top pick for best playpens. Having a baby is not an excuse to stay indoors. Limiting yourself to the benefits of sunlight and fresh air is also limiting the same benefits to your little one. You and your baby can definitely be safe and happy out in the sun. You just need the proper gear to make things work out for you and your family. That's why the Summer Infant Playard is the best choice for outdoor fun and playtime with toddlers. You can also get to enjoy the fun outings and activities with your other kids. If you are looking for a playard that can be set up and put down in a minute or less, then you should really go for the Summer Infant Pop n Play. It just pops up like a pre-assembled tent and let your kids go in and play. There are many things to love about this playpen for babies. First of all, the material is really durable. It can withstand high pressure. So, even if it gets clunked around with the rest of your furniture or tossed around the back of your car's trunk, you have less to worry about. It is very lightweight and super compact too when you fold it. It also comes with its carry bag making travel very easy too. We assure you that your picnic is going to be just as fun and exciting as you have planned it. This particular playard for toddlers has a canopy that easily blocks off the sunlight. It prevents the sunlight from batting down on your kids as they play on their own. We also love that the fabric barrier is made with stretchable sturdy mesh. It allows air to freely breeze in and allows greater ventilation. The bottom lining of the playard is made of an easy wipe, easy clean fabric, so mess and mush are not a problem. You can simply wipe away and let your children come and play again. We love that it has a wide diameter. We have instances of children tipping the entire playpen over if they run from one end to the other. It can be potentially dangerous for our toddlers. Since this playard is wide, it would be unlikely that your little one would do the same. But still, anything can happen. We have proven that this is super great to use outdoors for a picnic or just indoors, with so many other toddlers to play with for that special gathering. It is lightweight, compact and easy to assemble making it the best indoor and outdoor playpen in our list. This is also our second pick for the best playpen for babies and toddlers. If camping with your family is one of the best family activities that you do together, and it is hindered simply because of a new addition to the family, then don't worry so much about it. Once your little tot is already good to crawl, you can get on your way back to those activities together. Family camping is a great way to bond and a great way to spend time with each other. But we all have to remember that babies also have special needs for camping and that is why we pick the Guava Family's Travel Crib Playpen for your little one. If your bags are packed and ready for camping, this is the best playpen or travel crib you can get in the market. We love the Guava Family's Lotus Crib so much. It is a cool table playard or crib for your little one. It is as portable as it says; simple to set-up because all you need to do is just pull it out and you are good to go. It also fits inside most tents good for 4 people. It's easy to bring around with you as your baby's own space for travel. One feature that is unique to this playpen is that it has a zipper locked doorway—like an actual tent, only this one doesn't come with a roof. If you want your baby to get out of the playpen and your tent is too short, just unzip the doorway and let your little one pass through. It saves you the energy of having to lift your child out of the crib as well. It also comes with a mattress by the way. It is lined with a super easy to clean fabric. So, no worries when your baby happens to make a little mess. You can just wipe it off. You will love that the sides are made of durable mesh. It allows air to flow through freely and also allows you to see through the mesh and check in on what your little tot is busy with. The mesh also allows your child to have a breathable space when they fall asleep. We find this quite ideal because there are times when our babies are just too sleepy while playing that they just slump on the floor and nap. But as we move them to their cribs, they just end up waking up. This is great because they can just slump over and nap and let them have their sleep continuously. Comfy and super convenient, right? One thing moms will love about this playard for toddlers is that it is the only playpen travel crib that has ever received a Greenguard Gold Certificate for being a low chemical emitting baby item. And for that, we give it a two thumbs up and an applauding spot number three for the best baby playpen and also the best playpen for travel overall! Cosco Funsport Play Yard is simple, easy to move around and definitely a safe place where our kids can play without bothering us around the house. Our little ones can get into places we have no idea how they get into and they can also grab things we have no idea they can. Babies can really surprise us with things that they can do but we don't want to be surprised when it comes to accidents. And as our little ones grow, one of our main priorities is actually baby proofing our homes. Their curiosity is really admirable but we really need to set their limits. 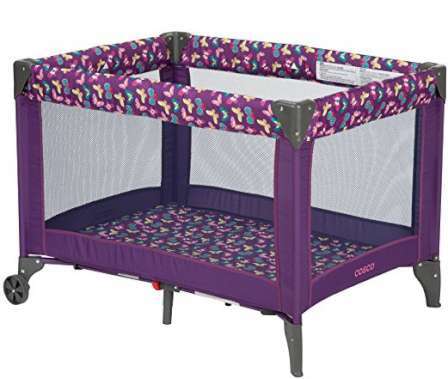 If you're a busy mom and still need to keep an eye on your active toddler, you will love Cosco's Playpen for babies. The playpen is enough for your little one to play around in. It is also great on space especially if we have a tiny home. It is the cheapest playpen on our list and also the cheapest toddler playard made with great quality that is definitely a love factor for the Cosco Playard for babies. Another reason why we love it is the fact that the sides are also made with mesh which makes it easier for us to have a constant eye on our little one. It allows great ventilation as well, so it is easier for the babies to have better rest and airflow within. We know how some babies can sweat, and staying in a damp playard is just making it a breeding ground for fussy babies. We love that it easily folds up in just a few minutes. It is very easy to set it aside as well to keep it out of the way when not in use. This playpen is quite convenient that way because having it stay around the living room or the bedroom when not in use can be an eyesore. So, keeping it folded and kept aside for the meantime is not a problem since it is just as easy to set it up. It comes with a carry case as well; however, it is pretty heavy unlike the other contenders in our list. With the weight though, it doesn't pose much of a difficulty when you want to move it around. So, if you are feeling quite lazy to pack the toys inside, just fold the child playpen and then set it up again in another room. Or you can just simply lift it up and push or pull because two of the end stands are on wheels. So despite it being slightly heavier, the fact that it has wheels makes it easy to move around. And that is why this is the fourth best play yard for babies and also our best value playpen for babies. Kids just love grabbing toys and making a mess of them all everywhere. We love that they move and play around but we need to set restrictions for our active child. There are plenty of hazards that our children may get into. Actually, we don't even know much about how much danger they are in until they get into an accident while they were playing. Kids may find themselves traumatized because of certain accidents and we can't let that happen. We need to set a place where they have easy access to their toy storage boxes and still have a limited space where they can play. It made us consider the Best Choice Product's Playpen for babies. Playards are meant to do one main purpose: set a space for your little ones to play in. But, there can also be a problem in the equation which is the space in your house. No house has the same layout and setting up a playpen for babies in your home may take up a lot of your own personal space. We love the Best Choice Products' Playpen as it comes in panels where you can set up a certain space for your kids whether it is a big or wide space or just enough space for your tot to crawl around. The panels give you a better option for customized space. You can also make the shape that you want—circle or hexagon, square, triangle, rectangle, whatever—you can set it up depending on the space available in your home. We also love that setting it up can be a fun bonding time with your little one. You can teach them the colors, and also do them alternately or same colors on one side. It also comes with a doorway, so you can easily pass through without a sweat. We know you wouldn't want to jump over it and end up knocking the whole thing over. Another thing we love about it is that it comes with educational decorations. Some sides have shapes and play panels that your kids can enjoy. It is colorful and fun and a great space saver for you and a space maker for your little ones. This completes our list of the best playpens for babies. Play yards for babies or toddlers create their own space to play with. In a sense, you are building an entirely new world decided for them to have the freedom of play with lesser danger hazards and lesser clean-up. Baby playpens are very beneficial and they aren't that expensive either. They help you have a peace of mind in keeping your child safe and secure but also keeps your little one entertained as you do other things as well. We have tested these playpens that will match your different needs and requirements for choosing a playpen for baby and we are sure that you won't regret your pick.